Posted on May 6, 2015 at 8:39 pm. 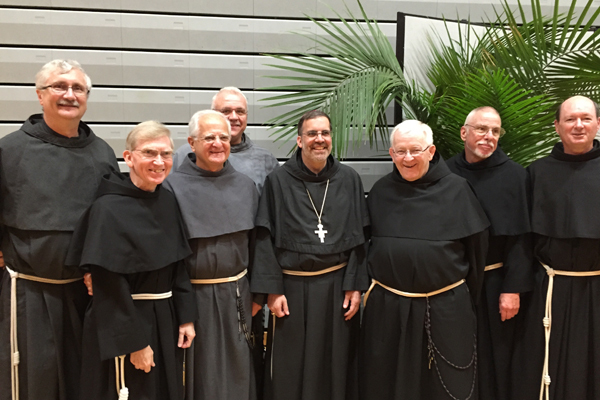 On Tuesday May 5, 2015, +John Stowe, OFM Conv. 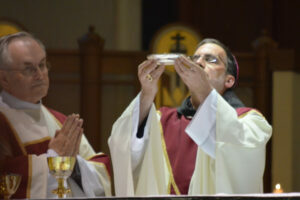 was ordained and installed as the third Bishop of the Diocese of Lexington, Kentucky. Bishop Stowe, 49, was until recently the Pastor and Rector of the Basilica and National Shrine of Our Lady of Consolation in Carey, Ohio. Born April 15, 1966, Bishop Stowe professed solemn vows as a Conventual Franciscan Friar on August 1, 1992, and was ordained a priest on September 16, 1995. In addition to his assignments for the Province of Our Lady of Consolation, he served as Vicar General for the Diocese of El Paso, Texas. Until his appointment as Bishop of Lexington, he had served for the past several years as Vicar Provincial of the OLC Province. In his remarks at the end of the Ordination, Bishop Stowe said that although he is now the leader of the Diocese of Lexington and longer a member of the Province, "I am, and always will be, a Franciscan." Bishop John Stowe poses with Assistant General Jude Winkler along with former and present Ministers Provincial in North America. Of his many gifts and abilities as a pastor and administrator, Bishop Stowe is best known for his Franciscan commitment to the poor and those on the margins of society. Completely fluent in Spanish, he is devoted to ministry with the Hispanic/Latino community. The Diocese of Lexington encompasses most of southeastern Kentucky, including the Appalachian portion of the state. Although registered Catholics comprise a small percentage of the population, the Diocese’s outreach embraces people across the religious spectrum. And there are many baptized Catholics who are unregistered or have walked away from their faith. Bishop Stowe, the Diocesan clergy, and the staff of the Diocese are committed to serving the entire community.